People who live or work downtown are accustomed to buying their aspirin from one of those big box pharmacy chain stores. The kind with another big box competitor across the street. The L. S. Stockman Drug Store proves half of that hasn’t always been true. 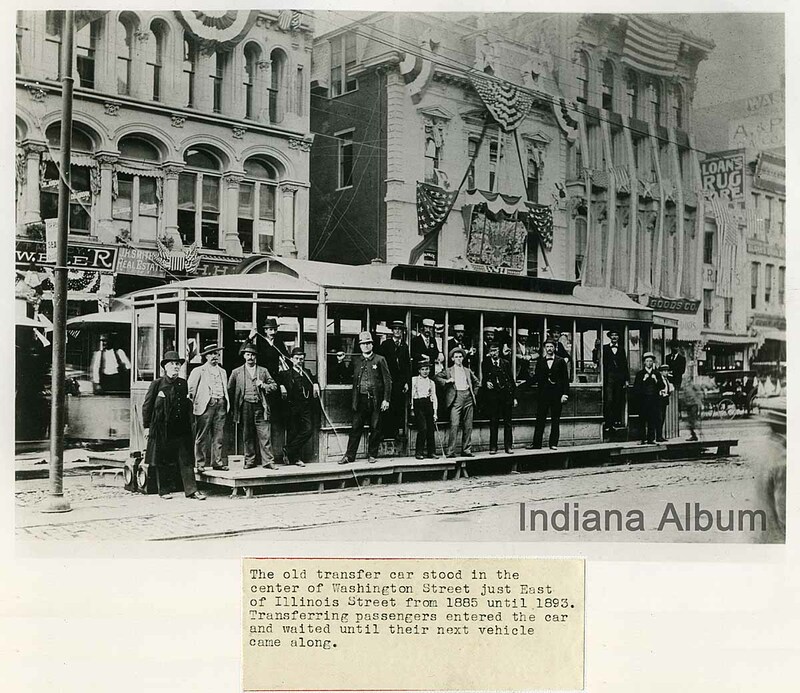 Louis Soyez Stockman moved from Lawrenceburg, Indiana to Indianapolis in 1883 in search of a brighter future in the big city. His entrepreneurial journey began by clerking for five years for J. M. Scott, an independent “druggist” on Indiana Avenue. 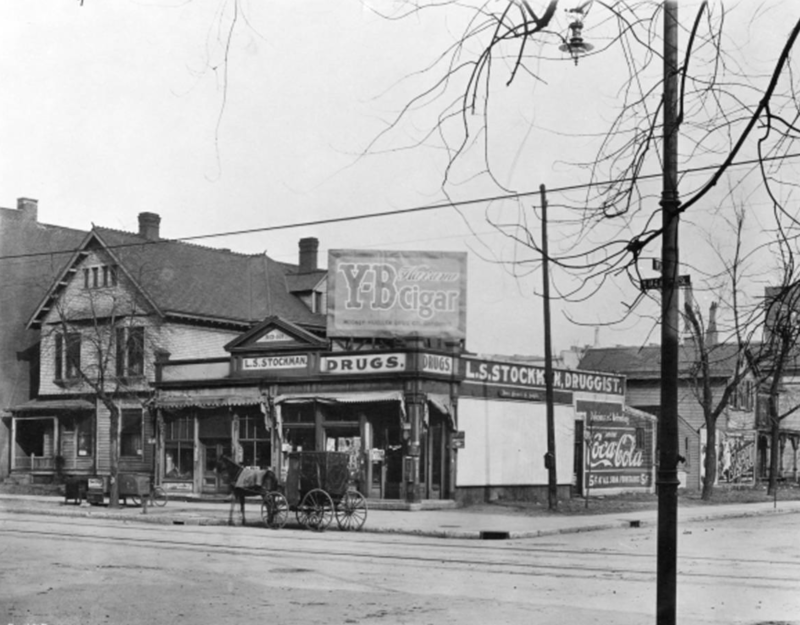 Stockman didn’t begin dispensing products and remedies as the druggist of his own modest drug store on the northeast corner of Illinois and Michigan Streets until 1888. His new building had space for a tenant north of him, and for the first few years, he lived behind his shop. 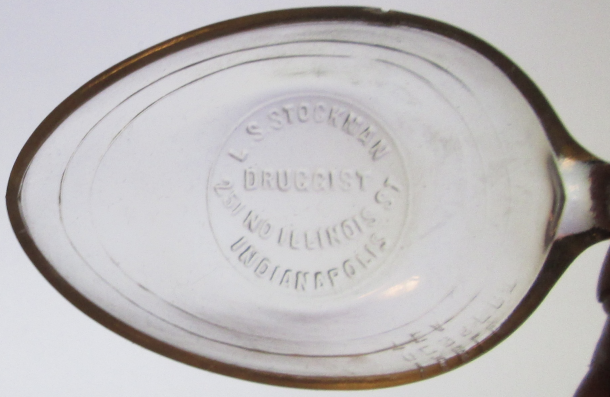 Stockman measurement vessel–spoon? Pre-1898 address. He wasn’t just a druggist, though. He was an independent local businessman and merchant. Beyond elixirs, he also sold Furnas ice cream, Y-B cigars, Fan-Ball baseball cards, Buster Brown bread and other sundries. The King of Roach Powders was a product he manufactured and sold for a number of years. Now and then, items from Stockman’s store will pop up, if you keep your eyes peeled or if you frequent eBay. The L. S. Stockman shop had plenty of traffic, also serving as a city voting precinct for years and Star Branch No. 3: a place in the neighborhood where anyone could stop in and leave a classified ad for the morning newspaper for only one cent per word. As with most entrepreneurs, having an independent drug store had its challenges. 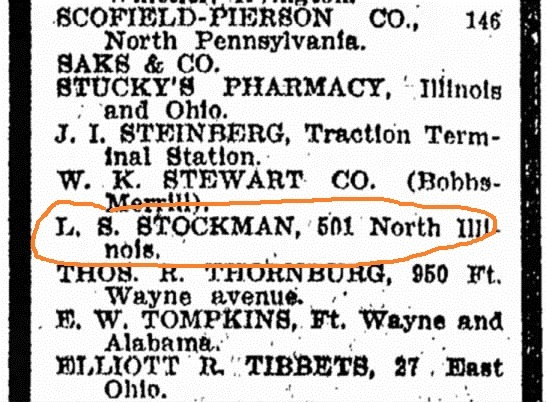 In 1900, Stockman was among a handful of druggists fined $5 for selling liquor without a license. In 1914, his business was listed as selling illegal cough medicine–that contained alcohol without listing it among the ingredients. External challenges involved keeping unsavory characters out of the building. Stockman caught a burglary in progress in November 1903 at his adjoining tenant’s grocery store. 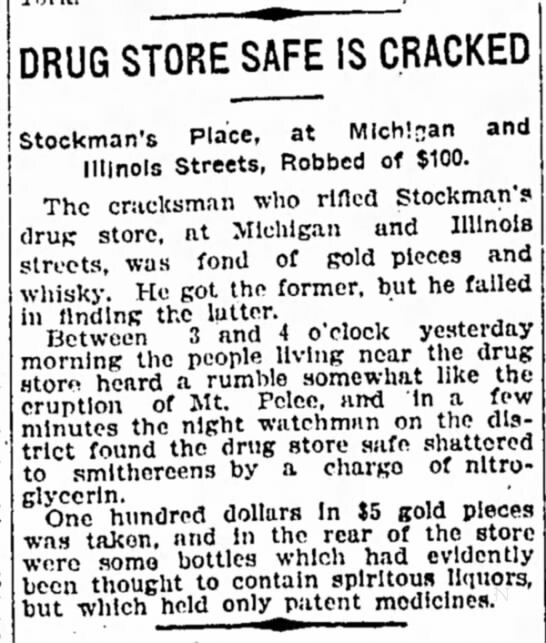 Only months later, in July 1904, the local paper reported a “cracksman” had rifled through Stockman’s place in search of gold pieces and whiskey. “Between 3 and 4 o’clock yesterday morning the people living near the drug store heard a rumble somewhat like the eruption of Mt. Pelee, and in a few minutes the night watchman on the district found the drug store safe shattered to smithereens by a charge of nitroglycerin. One hundred dollars in $5 gold pieces was taken, and in the rear of the store were some bottles which had evidently been thought to contain spirituous liquors, but which held only patent medicines.” Robbing drug stores is not an invention of the current age. And lest anyone think the practice of competing drug stores standing on opposing corners is a newer phenomenon, it’s not. Stockman’s northeast corner store faced Henry J. Huder’s southeast corner drug store for many years. Louis Stockman’s shop at the corner of Illinois and Michigan lasted for 25 years. 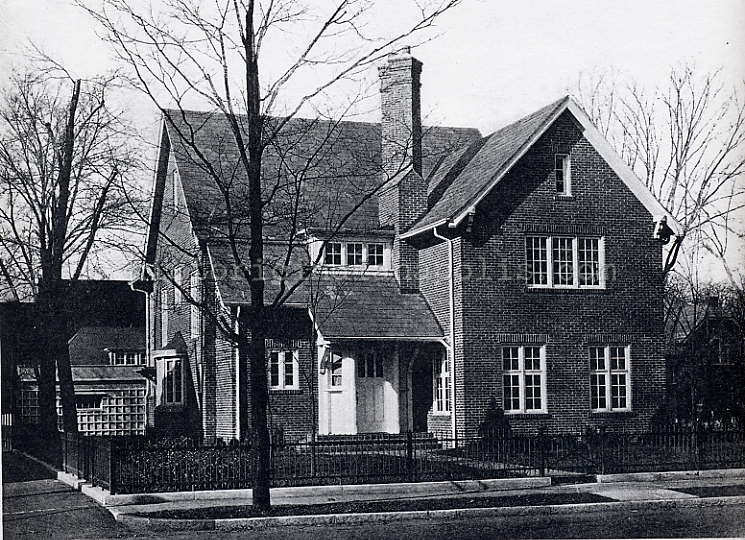 In 1913, Stockman moved operations to 2958 Talbott Avenue–now part of a block-long parking lot. His old building on Illinois Street remained vacant briefly, but by 1915, auto-related uses filled the space. 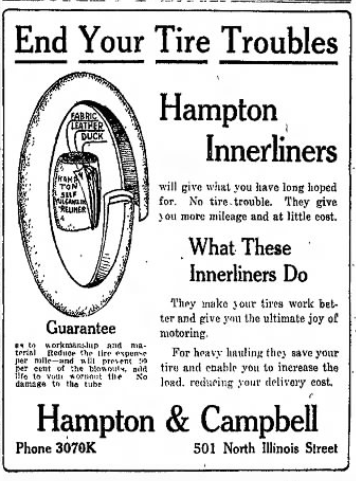 Hampton & Campbell tire inner liners appear to be the next tenants. Stockman’s pharmacy moved again, before his career came full circle and when returned to managing the drug store of J. M. Scott–and Son– by 1917. 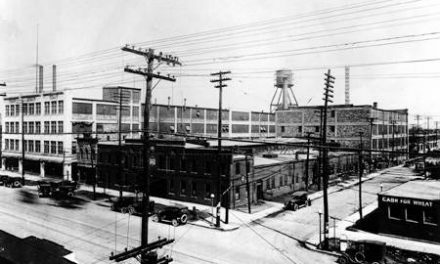 From 1917 to 1931, the 501 half of the Illinois Street property was home to Waters & Harris Auto Tires, Harris Storage Batteries, and Meo & Markowitz Produce. The 503 suite became home to George Woodward Billiards, Eureka Auto Parts and, finally, W.T. and W.A. Auto Top Builders. In the early 1930s, demand for downtown parking outweighed the value of the the Stockman building. The corner became home to Illinois Service Corporation Parking, and later, Paetz Auto Parking. It was the first domino to fall in what had been a dense block of structures on the east side of Illinois Street from Michigan to North Streets. 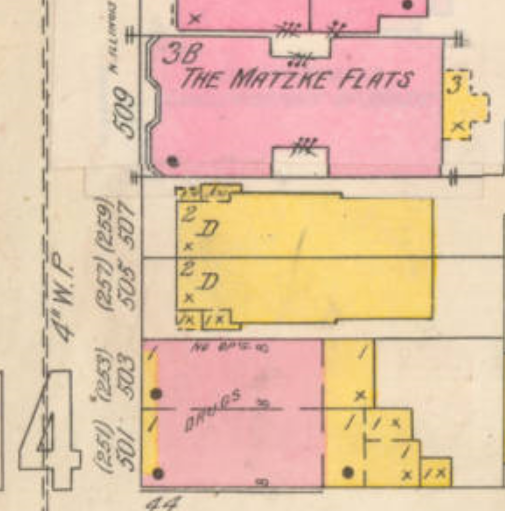 By 1950, the first building on that side of the street north of Michigan was the Matzke Apartments at 509 North Illinois. By 1970, it was American States Insurance at 517 North Illinois. The building stock continued shrinking. 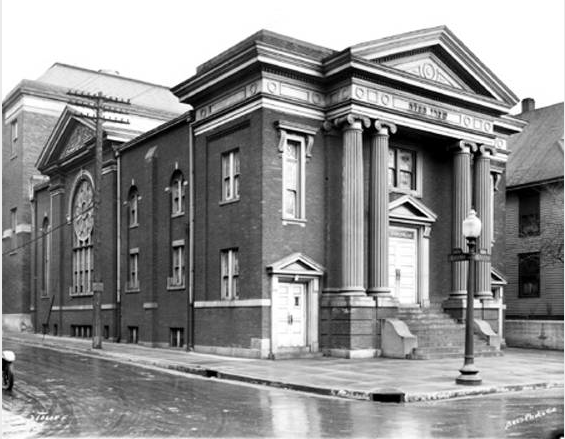 In 2017, The Masonic Temple at the corner of Illinois and North Streets is the only building on the block, save the small, vacant concrete block structure on part of the former Stockman building footprint. This diminutive structure was a claim station for Safeco Insurance Company, moved there from 500 N. Meridian Street, just east of the parking lot across Pierson Street. An elevator to a parking garage skywalk also stands on the block, but doesn’t count as a building. 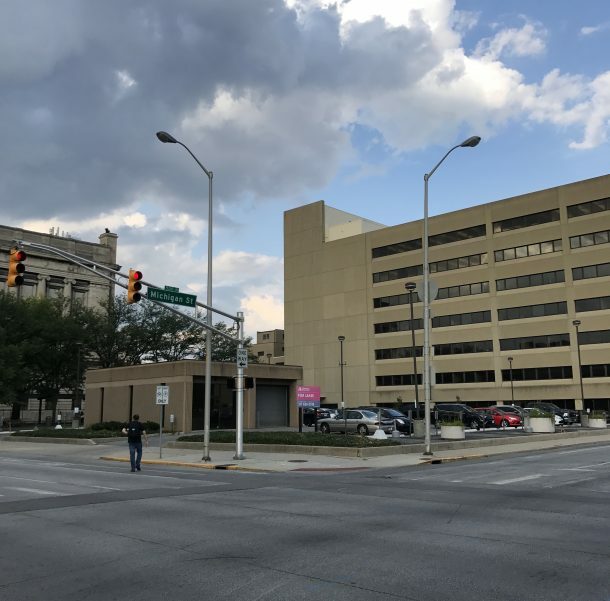 Safeco has long since vacated, and the building at 500 North Meridian Street is full of other enterprises, whose employees park their cars in the lot along Illinois Street, just as Safeco workers did. A sign indicates some of this property is for sale. Only time will tell if Louis Stockman’s corner of 85 years ago, finds new life as something more than a parking lot. Wouldn’t a local independent business be nice? Looking at the northeast corner of Illinois and Michigan Streets, where the Stockman building stood.